Image Size 18.75 x 18.75 in. Rosemary Sloot is a Canadian born London artist who attended The Nova Scotia College of Art and Design during it’s hey-day in the mid 70’s, received an M.V.A. in painting from The University of Alberta and a B. Ed. from The University of Western Ontario. She was a part-time painting instructor for twenty two years, teaching at Lakehead University in Thunder Bay in the early 80’s and has been painting for forty years. She has work in public collections in Canada and private collections in North America and abroad. Her most recent traveling exhibition was IMMIGRANT which dealt with her family’s immigration experience to Canada from The Netherlands in the years following W.W. II. and she is currently working on a book about the show to be published this year. 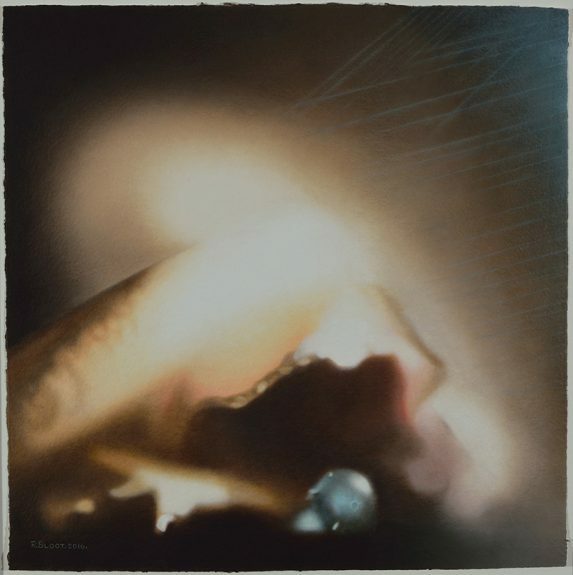 Ghost Shell Blue is an oil painting executed on thick, rough paper made by Dan Mezza, under whom I studied paper making at Western University. I find I am able to work out my Ideas more quickly on paper than canvas and the roughness of the surface acts as a deterrent to the rendering of fine detail. This series of paintings looks back at my still life work done during the earlier part of my career but now the images lack specificity, are out of focus, a devise I began to use in IMMIGRANT and are becoming more abstract so that the viewer is encouraged to contemplate the objects and be drawn into the dream-like space.